Eleven essays from leading scholars in Buddhist Studies honor the late Godwin Samararatne. Known as a: scholar, meditation master, social work, and spiritual friend to many in Sri Lanka and beyond. Each essay offers new interpretations of Buddhist texts and practices central to the life of the Dhamma in South and Southeast Asia. Topics range from Buddhist theory and origin to practice and application. 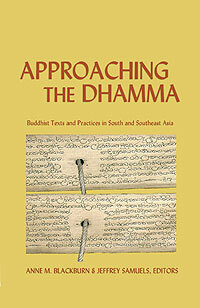 The authors address complex questions related to the interpretation and understanding of Buddhism. A diverse range of positions stratify the meaning of the Buddha's teaching through contextual discussions about attitudes, death, emotion, social service, ritual performance, past lives, lay meditation, and more.